Procrastination strikes everyone, and once it gets ahold of you, it can be very difficult to shake it off. When you imagine a highly productive person, you likely think of someone who focuses effortlessly on the job and never succumbs to procrastination. You know, the type who can sit on the ground in a subway station with their laptop and still manage to get more done in an hour than you would in a day at the library. Instead of being lazy or disorganized, people usually put things off because they aren’t in the right mood to complete the task. Doing so places you firmly inside the procrastination doom loop. Since you’ve decided that you aren’t in the right mood to work, you distract yourself with other tasks -- checking email, checking the news, cleaning your desk, talking to a coworker, etc. -- and by the time you come up for air, you feel guilty for having wasted so much time. This only worsens your mood, and as the deadline draws closer, you feel worse than you did when you first put off the task. When you aren’t in the mood to work, procrastination is telling you something important. It could be something simple, such as you need to take a break or get something to eat. It could also be something complex, such as you’re carrying the team on your back or you’re dissatisfied with your job. Whatever it is, instead of punishing yourself for procrastinating, take a moment to reflect and figure out why you’re procrastinating. This could end up being the most productive step you take in conquering your task. Prior to getting started on a task, take a moment to carefully consider the obstacles that might get in your way. Then, develop a plan to ensure that they don’t. For example, you might have instructions for a task in your e-mail inbox, and if you don’t do anything about it, you’ll repeatedly go back to your inbox to look at them, only to get distracted by other incoming e-mails. In this case, your management plan should be to get the instructions out of your inbox prior to starting your work. By planning ahead, you can maintain your focus and avoid procrastination. After all, it’s much harder to regain focus than it is to maintain it. 3. Jump right in, no matter what. Sometimes it’s really hard to get started on something, even when it’s something that you love to do. I might be staring at a blank Word document or standing on the beach on a cold winter morning. That first step is difficult, but once you get going -- typing that first paragraph or taking off on that first wave -- your mood improves dramatically. When you focus your attention on how difficult and cruddy it is to get started, you discourage yourself from doing so. When you dive right in no matter what, your mood quickly improves, which helps you to stay on task. 4. Cut holes in your project. We often procrastinate because we feel intimidated by the size of a project. To minimize intimidation, try cutting holes in it. Find smaller pieces of the task that you can quickly and easily accomplish. For example, writing a proposal might require 10 hours of intense concentration, but you can spit out an intro in 15 minutes and develop a list of deliverables in 10. Before you know it, these smaller tasks have cut serious holes in the project and it’s no longer intimidating. 5. Work in the right environment. Even if you do everything else right, working in the wrong environment can make you succumb to procrastination. This means keeping yourself away from television, electronics, friends, and loud places. This isn’t what works for everyone, but you need to exercise discipline by working in the environment that’s right for you. There’s nothing quite like checking something off of your to-do list. To keep yourself from procrastinating, you need to experience this sense of accomplishment by tracking your progress carefully. Small victories build new androgen receptors in the areas of the brain responsible for reward and motivation. The increase in androgen receptors increases the influence of testosterone, which further increases confidence and eagerness to tackle challenges. This keeps you fired up and moving forward. Sometimes crossing a few easy things off of a list is all it takes to build up the mental strength to tackle something big. Remember, it’s not about doing small tasks to avoid big tasks; it’s about including small tasks in your daily checklist to build your confidence and momentum. Setting unrealistic goals for your day is a great way to become discouraged and to succumb to the negative moods that fuel procrastination. Setting realistic goals keeps things positive, which keeps you in the right mood to work. 8. Take control of your self-talk. Saying to yourself, “I’m not going to procrastinate. I will not procrastinate,” virtually ensures that you will procrastinate. There’s a classic study where participants were told to not think about a white bear. It turns out it’s nearly impossible to avoid thinking about something that you tell yourself not to, as your mind gravitates towards the thing you’re trying to avoid. The trick is to shift your attention to something completely different (and positive). Instead of telling yourself not to procrastinate, think about what you will do and how great it’s going to feel to have it done. This way, your mind fixates on the action you want to take instead of the behavior you’re trying to avoid. 9. Don’t be a perfectionist. Chances are, you don’t enjoy going to the dentist. Not many people do. So why do you go? It gets results. Your dentist is quite good at making your teeth and gums healthier and more appealing. You also go because the pain of having someone pick at your teeth for an hour is nowhere near the pain of getting a cavity filled, a tooth pulled, or a root canal. You go to the dentist because you know the process is worth it. The same mentality applies to a challenging task. While it may make you anxious to get started, don’t focus on that. Just think of how great it’s going to feel to get things done and how much worse you’ll feel if you wait until the last minute and don’t give it your best effort. There’s no point in beating yourself up when you slip up and procrastinate. 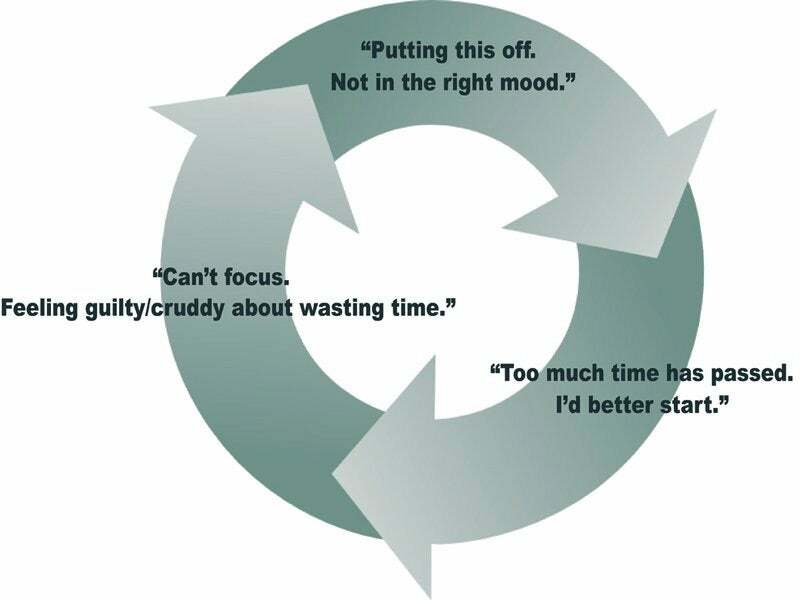 You might think that punishing yourself will help you to avoid procrastination in the future, but it actually has the opposite effect -- beating yourself up sends you right back into the procrastination doom loop.